I’ve been a little bit in love with Billy Crudup ever since I watched Almost Famous six years ago and Russell Hammond walked onstage to perform “Fever Dog”. Imagine my delight, then, to hear that Crudup was once again going to be playing a musician. Luckily for me, Crudup doesn’t disappoint and gives yet another great performance to add to his eclectic filmography, in the simply shot but undeniably soulful film Rudderless. Sam’s life is torn apart by the sudden death of his son after a tragic university shooting. Living off the grid on a docked sail boat, he goes about his days working as a painter and drinking himself into oblivion, numbing himself to real life. Upon discovery of his son’s music, he uses his songs as a means to grieve. Through his son’s music he connects to him and learns how to live his life again, despite the fact that his boy is gone and he can’t ever be whole. So starts his emotional journey. He decides to play one of his son’s songs at an open mic night, drunk, and it’s raw and heartfelt despite no one in the bar taking any particular notice, except for one. Quentin (Anton Yelchin) thinks there’s something special about the song and says that songs like Sam’s aren’t written to gather dust, they’re written to be shared. After some convincing, Quentin and Sam join up together to play more of his son’s songs under the guise of them being their own and soon, in a lovely little montage, they’ve got a bass player, a drummer, a set to play every week, and a burgeoning group of devoted fans. I’m a sucker for movies that do music well. I said it about this summer’s sleeper hit Begin Again, and it’s part of the reason why Almost Famous resonates with me so much; hell, it’s also part of the reason why Whiplash caught my attention. Filmmakers who utilize musical performances in their films don’t always succeed, but when they do it’s often a highlight of the film with the music being some of the most honest reflections of who the character is and how they got there. It’s why Sam is drawn to his son’s songs, to try and understand a part of him that he never got to see before the tragedy, and it’s why we’re drawn to Sam. When he sings the songs they become a haunting reminder of what has happened, and when he plays them with the band it becomes a lively experience where we bear witness to some of his own spiritual healing. It’s William H. Macy’s first feature film, and while there’s nothing obviously noteworthy about the direction, I can say that the live music, bar, and general atmosphere were captured wonderfully. There’s a certain type of energy shared when people all gather together to watch a band they love perform live; when they all know the lyrics to the songs, are buzzed on live music and beer, it’s an infectious energy that Macy catches. Where Macy falters is with the abundance of visual and scripted metaphors, and underserving the subtle moments with scenes such as Sam breaking down sobbing in the middle of a court yard and a perfectly timed moment for an emotional peak. The work that Crudup does here is as good as he’s ever been, and it’s a shame he’s such an underrated performer because he does a lot with very little. You just need to look at his face to grasp what he’s feeling at any given moment. He has a charm about him that makes him innately watchable and he never tries to oversell what Sam is feeling and well. It helps that the rapport with Yelchin is also strong, since it’s their relationship we need to buy for the majority of the film. Yelchin is another actor who also seems to go under-appreciated despite the interesting work he’s done over the past few years. Sam and Quentin are both looking for something specific in one another, even if they don’t mention it out loud: Quentin is looking for someone who cares about him and believes in him, and Sam is looking for a surrogate son of sorts, someone he can help in a way he thinks he didn’t get to help his own son. That’s about as much as I can say about the plot without giving too much away. For all its simplicities and faults, the script manages a few surprises, and it’s what makes watching the film unfold so interesting. A strong debut from Macy and some great performances by the two leads makes this a good, if not great film, but certainly one I enjoyed watching. 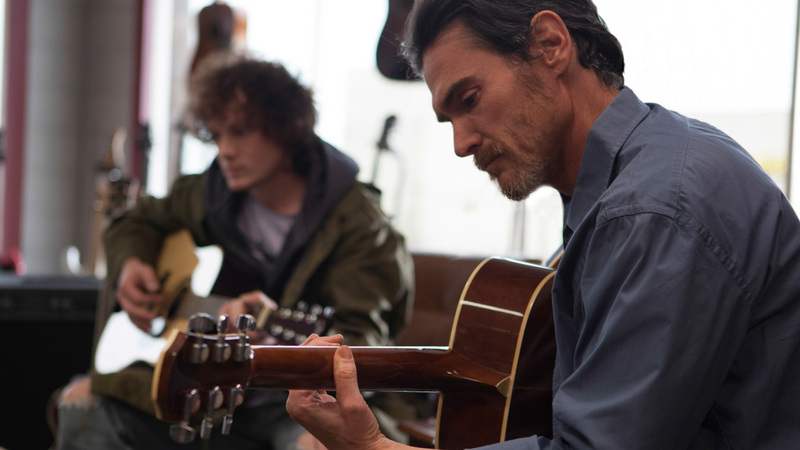 Rudderless is out in limited release now. Previous ArticleMusic News: Taylor Swift Releases New Single, "Out of the Woods"
Is a Second Season of ’13 Reasons Why’ Really a Good Idea?